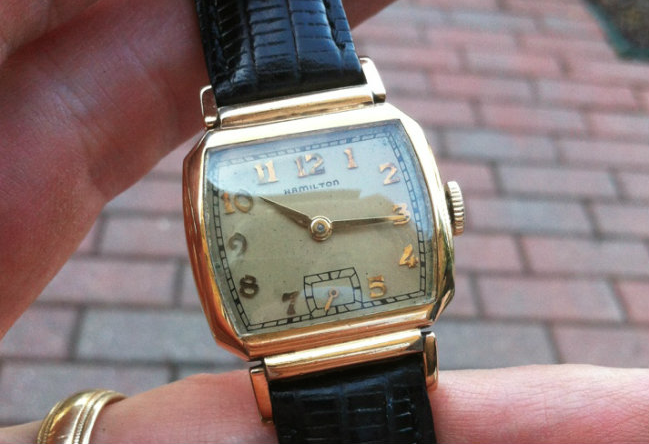 The Hamilton Reagan was introduced in 1938 and produced for three years. I looks quite similar to the Harris model introduced in 1937 and the two were available together in 1938 before the Harris was discontinued. Behind the dial you'll find a 6/0 sized 987A movement with 17 jewels. Someone asked me the other day what the 17 jewels were. Generally speaking, when it comes to jeweling, "the more the better" - but it really only takes takes 15 jewels to "fully jewel" a watch. However, I've found that different makers sometimes used jewels in different places - even though the counts were the same. 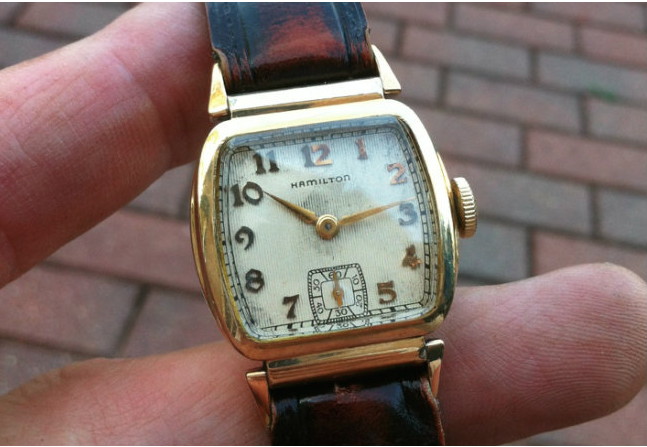 Hamilton marketed it's watches as having a minimum of 17 jewels. Usually the higher end watches got movements with additional jewels. The jewels are just that - usually rubies or similar stones that serve as very low friction bearing surfaces. There are four wheels in the gear train... the center wheel, the third wheel, the fourth wheel (what the second hand is often attached to) and the escape wheel. Both ends of each wheel's axle rests in a jewel for a total of 8. The axle (arbor) for the pallet fork gets a jewel on each end, plus the two pallet stones that engage the escape wheel are jewels. That's a total of 4. The balance wheel also has an axle (the balance staff) and it rests in a jewel on each end. In addition, the impulse pin on the balance that engages the pallet fork is also a jewel. That's a total of 3. If you add that up you'll get 15... so where are the other two? They're cap jewels and cover the jewels on each end of the balance staff - protecting it from the entry of dirt, etc. That brings you to 17. An 18 jewel movement will have an additional wheel (for the sweep second hand) and the end opposite the second hand will be set in a jewel making the count 18. 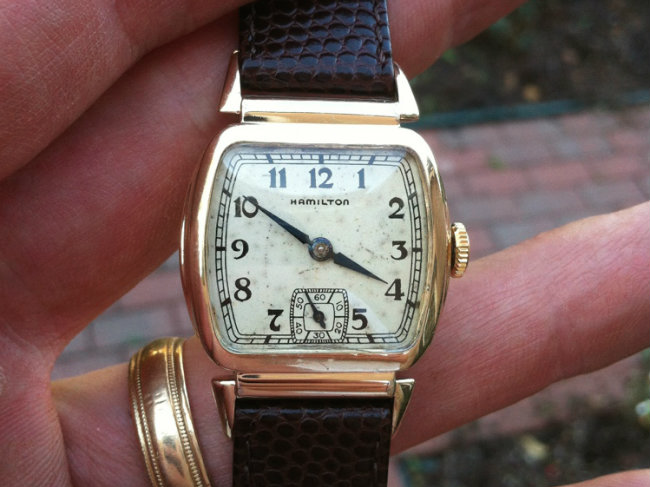 A Hamilton movement with 19 jewels just adds cap jewels to the escape wheel. The higher the count of jewels, the more cap jewels are added until even the mainspring barrel is inset within jewels. Getting back to the Reagan, the 10K gold filled case is often found with wear through to the corners of the bezel where the lugs join the case. Sometimes an extra-thick crystal will protect the case from wear - but it's hard to find a Reagan without at least a little bit of wear through. Two dial options were available... the AGN dial (most common) and a black enamel dial. The AGN dial is an interesting textured design - common for this period of watch models. Here's a shot of an enamel dialed Reagan I recently overhauled. The case is surprisingly nice. And here's an AGN version as well. This dial is original and it had a dark spot in the center from years without a crystal. I was afraid to clean it too much and risk losing the lettering. It looks much better in person as the photo exaggerates the darkness. And just for comparison, here is shot of a 1937 Harris. The similarities are obvious. Although the Reagan is more square than the Harris's rectangular shape, to me the easiest way to spot the difference is to look at the seconds track. The seconds track will usually emulate the crystal shape and as you can see the Reagan's seconds track is big enough to contain numbers while the Harris does not. Ha ha! I can help you with that! I just purchased an AGN Reagan in fairly good shape, some brassing on the bezel and lugs but otherwise pretty nice. Thanks for this article, Dan, especially the info on the jeweling of the movement.